(CNN) -- It happens every season. 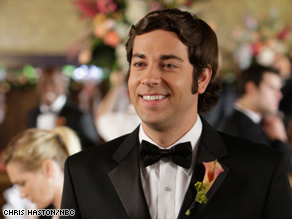 NBC's "Chuck," starring Zachary Levi, has inspired fans to launch a vocal campaign to get the show renewed. Word gets out that a television show is "on the bubble" and may be canceled. The reasons vary, but more often than not, the ratings don't match the adoration of the fans. Some go gentle into yonder good night, often to the place known as available-only-on-DVD-land. Yet still others manage to serve as a rallying point for fans and critics alike who have a single, collective message for the networks: SAVE OUR SHOW! This season, a swirl of programs have generated the "will they or won't they" buzz, including ABC's "Better Off Ted," "Castle" and "Samantha Who? "; CBS' "Without a Trace" and "Eleventh Hour"; and Fox's "Terminator: The Sarah Connor Chronicles" and "Dollhouse." But perhaps the one getting the most attention is the NBC show "Chuck," which has spawned a "Save Chuck" campaign with fans trying to blog, tweet and even eat sustained life into the series. iReport: What show are you trying to save? "I watch a lot of TV as a television blogger, but I think that 'Chuck' is a really special show," said Kath Skerry, who helped kick off the movement when she declared it "Chuck week" on her blog, GiveMeMyRemote.com, and temporarily changed its name to "GiveMeMyChuck." "Chuck" tells the tale of Chuck Bartowski, a computer geek-turned-unlikely government secret agent, and the colorful characters he meets along the way. Skerry, who also got the word out to her more than 1,000 followers on Twitter, acknowledges that fan campaigns to keep favorite shows alive are as old as the tube itself. iReport.com: What show do you want saved? "Star Trek" was saved by letter-writing campaigns in the 1960s. Fans of the drama "Jericho" won the series a temporary reprieve after they sent tons of nuts to CBS executives, a reference to an epithet uttered by a character. UPN's "Roswell" also had fans to thank for renewal after thousands of bottles of Tabasco sauce -- the show's aliens' condiment of choice -- were delivered to the network's decision-makers. The explosion of social networking seems to have upped the ante for "Save Chuck" as bloggers, critics and fans have taken to the Web and expressed their love of the show all over Twitter, Facebook and other sites. "I wanted to do what I could, and the fact that so many bloggers, fans and more traditional TV critics took up the plight got me very excited," Skerry said. "It's a show that the entire family can enjoy, and we don't have many of those left." Alan Sepinwall, television critic for The Star-Ledger newspaper in New Jersey, added his voice to the roar calling for the renewal of the show for a third season. He said the show is unique with its blend of romance, action, drama and comedy. Sepinwall noted that NBC has a lot less prime-time real estate these days with the new Jay Leno show set to debut, but he points out that series like "Seinfeld" were almost canceled multiple times before they found success. Fans have been smart in their ideas, he said, such as the move to have viewers buy foot-long sandwiches from Subway restaurants before watching Monday's season finale and leave comment cards letting the sponsor know they want the show brought back. iReport.com: Fans go to Subway in big numbers for "Chuck"
Subway sandwiches popped up as a product placement in the series this season, and the show's star, Zachary Levi, lent his support by leading hundreds of fans into a Birmingham, England, Subway, where he served up a few platters. It's just that spirit of fun that makes the show so special, say supporters. "There are deeper shows on TV, there's maybe more ambitious shows, but nothing on TV makes me smile and makes me happier than 'Chuck,' " said Sepinwall, who snagged a sweet onion chicken teriyaki from his local Subway the night of the finale. "It's really the only show I watch," Jones said. "It's humorous, it's got great pop culture references and music, and I know that it's something I don't have to worry about letting my kids watch. We love the show." "Chuck" co-creator Josh Schwartz said he is blown away by the overwhelming support. "The show has been a great gift to work on and we always really believed in it," said Schwartz, who has a hit on his hands with his other show, "Gossip Girl." "What we are trying to do with the show is something that is original and a blend of so many different genres ... and so I think it has the ability to reach a broad spectrum." Ryan McPartlin, who plays Devon "Captain Awesome" Woodcomb on the show, said he's been fascinated by the dialogue the campaign has sparked about ratings and how things like online viewership can be factored in to count towards the show's popularity. "There's something about knowing what time and day of the week your [favorite] show is going to be on and the comfort of that regardless of what's going on in your life," he said. "This is crunch time, and we've got to do what we can."